When the daily snow-slide of emails, Skype calling, internal business meetings and other business process gets overwhelming, it’s very much important to take a break and do something else for your business to increase its market value. No matter which industry we are in, we all want a good return value of our investment. And that is only possible when you know your customer in and out. I know we all do voice and video calling, messaging, emails and all other communication process with our clients & customers on regular basis, but nothing beats the power of a truly personal, face-to-face connection. At CDN, we care for our clients and believe in meeting them on a regular basis and that’s why we exhibit in the top ICT expos such as Gitex Technology Week 2016, CeBIT Hannover, CeBIT Australia, CeBIT India, CeBIT Australia, Communic Indonesia 2016, Communicasia 2016, Indiasoft and many others in a year.With our presence in these event, we can directly meet our clients and also generate new leads for our business. We are a consistent exhibitor of Gitex Technology Week since last 8 years. This year we are at stand no SR-E8, Sheikh Rashid Hall from 16th Oct- 20th Oct 2016. Know Your Business Growth Ideas by Our Experts: In Gitex Technology Week 2016 at stand no. SR-E8, you will get to know all the minor and major possibilities of your business growth by our experts and delegates. As you know CDN Solutions Group has a vast experience of 16+ years hence we have worked on spectrum of ideas. Isn’t it the great opportunity for you to meet with the industry leader face to face and get effectual solutions for your business? Position Yourself as an Expert: You can position your business as an expert by taking advantage of our skills, experience and knowledge. We can actually provide solutions suiting your business that can not only enhance your ROI but also make your business stand ahead of your competitors. New Vendor in your list: CDN Solutions Group can be an add-on to your list of vendors and suppliers. We are always at your discretion when you need IT related services. So selecting us as your IT partner can definitely boost your business. We Conceptualize your idea: The skilled team of CDN has the ability to formulate your idea. We first make sure that how exactly everything will come out to be. So it’s such a great opportunity for you to invest your time with industry leaders of CDN Solutions Group in Gitex Technology Week 2016 and know more possibilities to make your business a finest solution for your users. At CDN we are also providing free tickets to our valuable visitors. 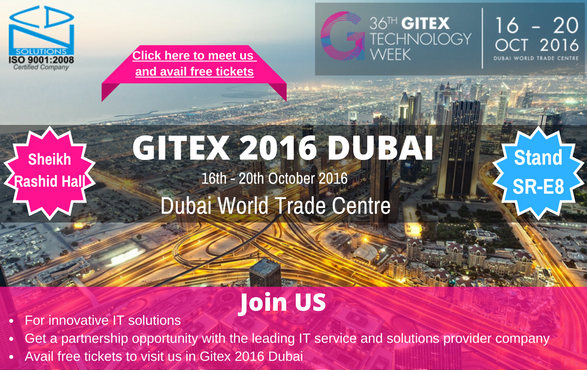 So avail your free passes for Gitex Technology Week 2016 with us that are worth AED 35.